My recent visit to Tanzania gives me hope. It started in Tarangire National Park, a beautiful northern ecosystem in which the population of elephants has doubled in 20 years. That's good news for elephants for a change. Conservation efforts are having a powerful impact thanks to strong national park law enforcement and grassroots efforts by conservation partners in the area. In Tanzania's Tarangire National Park, the population of elephants has doubled in 20 years. Credit: Cristián Samper/WCS. A Wildlife Conservation Society colleague, Charles Foley, first came to Tarangire in 1993 to work on his doctorate research on the impacts of poaching on elephant populations. These populations had been hit hard by the poaching crisis in the 1980s, but poaching stopped as the tourism industry strengthened. Charles and his wife Lara, who work in northern Tanzania, have been studying elephants for two decades, making it the second longest elephant field study worldwide. They estimate there were 1,800 elephants in 1996; today there are about 4,200. Their studies have shown that elephant populations can recover quickly if the conditions are right, and by as much as 7% per year. The story has not been as positive for other wildlife. The populations of zebra and wildebeest have declined about 30 percent during that same period, and Oryx may be down as much as 90 percent. Why? Tarangire National Park was established in the 1970s with help from WCS and covers 2680 square km. It lies in the seasonal savannas of East Africa and when the rains come in May/June, the animals migrate outside the park to feed on the grasses that grow in soils with higher nutrients. During the dry season they move back to the park. Tarangire serves as a refuge for wildlife, but much of the wildlife spends most of its time outside the park, where poaching is a high risk. The main threat to the wildlife today is agriculture and land use change in the larger Tarangire ecosystem. The communities living around the park are Maasai pastoralists. They do not hunt wildlife, except occasionally for predators like lions and hyenas that can eat their cattle. Some communities have started shifting to permanent agriculture, and there is less room for wildlife. The tourism industry and WCS recognized the problem a decade ago, and together started setting up conservation easements. These provide financial compensation to communities that keep land for cattle and not agriculture. Today, WCS and other conservation partners are helping communities get Certificates of Customary Right of Occupancy, where the whole community agrees to set aside land that cannot be used for agriculture. We are also helping communities patrol their lands with game scouts and use of the SMART (Spatial Monitoring and Reporting Tool) technology. Field surveys suggest the populations of wildlife have stabilized, and some may be starting to increase. The story is very different in southern Tanzania. Ruaha National Park and the contiguous Rungwa-Muhezi-Kizigo Game Reserve complex lost half its elephants in six years due to poaching. WCS started working in Ruaha in 2004, initially to support the establishment of community 'Wildlife Management Areas' next to the park. The revenues from tourism and hunting have helped local communities and avoided the transformation of these lands into agriculture. Cristián Samper with members of a local Maasai community. Credit: Gloria E. Jované/WCS. Nonetheless, many elephants were being killed across the landscape for their ivory. WCS helped the Government of Tanzania develop the first nationwide elephant management plan in 2009, in which the poaching crisis was first officially recognized. And we are now helping them produce an updated plan due for completion in early 2017. The poaching crisis continued as demand for ivory in Asia increased, and by 2014 the number of elephants in Rungwa-Ruaha was estimated to be around 15,000, down from some 32,000 in 2009. Similar patterns were observed in the Selous Game Reserve. Clearly, the situation was unsustainable and became one of the trigger points for the global response, including the launch of our WCS 96 Elephants campaign. Our response to the situation was to ramp up our work in Ruaha and Katavi National Parks, as well as the many connecting game reserves and open lands in the landscape. This covers an area of 115,000 square km and a total elephant population of approximately 20,000 animals. We signed a new Memorandum of Understanding and started supporting Tanzanian National Parks (TANAPA) in law enforcement, and the Tanzania Wildlife Research Institute (TAWIRI) in research and monitoring. 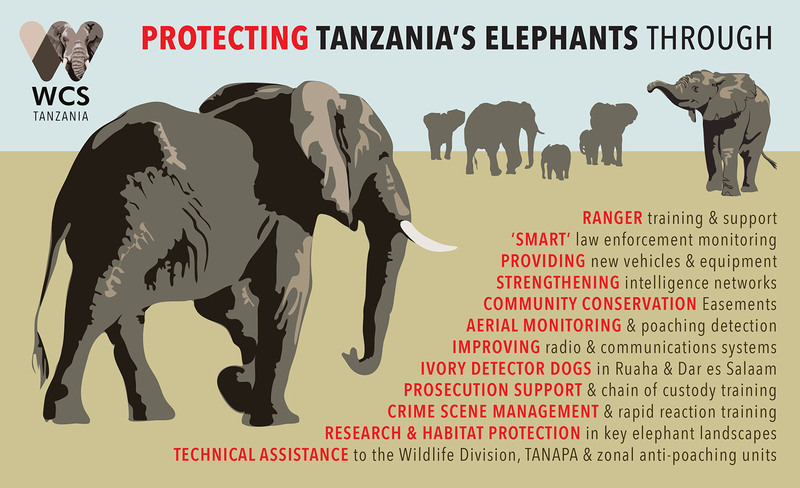 WCS helped the Government of Tanzania develop the first nationwide elephant management plan in which the poaching crisis was officially recognized. Credit: Cristián Samper/WCS. The global ivory crisis has resulted in new funding sources through USAID and private donors, and we have been able to ramp up our work substantially. Training in the use of SMART technology by rangers in 2014 has now rolled out to game reserves as well. Last year, we helped TANAPA establish a detector dog unit to help track and detect ivory, lion parts, weapons and ammunition. This year, we have built detector dog facilities in the port and airport in the capital Dar es Salaam, and have begun supporting the newly established Tanzania Wildlife Authority (TAWA), especially in law enforcement, ranger training, and resources in the game reserves across southern Tanzania. WCS has now deployed an airplane to help with aerial surveys and law enforcement. Credit: Cristián Samper/WCS. We have now deployed an airplane to help with aerial surveys and law enforcement. These surveys have indicated a decline in poaching, although the situation is still not under control. I had the opportunity to take a flight in our airplane and we did not see any recent carcasses in the southern part of the park. Similar stories are playing out across other landscapes where we work, including Niassa (Mozambique), South Sudan, and the Congo Basin. The situation is still critical, but I am encouraged by the global response and our own strategy to stop the killing, stop the trafficking, and stop the demand. While we are cracking the formula on the ground, it was also good news recently when attendees at the the International Union for Conservation of Nature and Natural Resources World Conservation Congress in Hawaii on Sept. 10 voted to recommend banning domestic elephant markets, as did governments at the Conference of the Parties to the Convention on International Trade in Endangered Species of Wild Fauna and Flora (CITES) gathered in Johannesburg on Oct. 2. WCS has ramped up its work in Ruaha and Katavi National Parks, as well as the many connecting game reserves and open lands in the landscape. Credit: Cristián Samper/WCS. Despite the magnitude of the challenges, I am encouraged by the global momentum building to end the elephant crisis and by visits to places like Tanzania. There, I have seen first-hand the profound impact of our dedicated staff (who are often supported by US government funding, including USAID) and the resilience of wildlife if given a chance to recover. This gives me hope.